Macaulay Honors College student Yeniliz Peguero assisted with a Peruvian referendum last December. 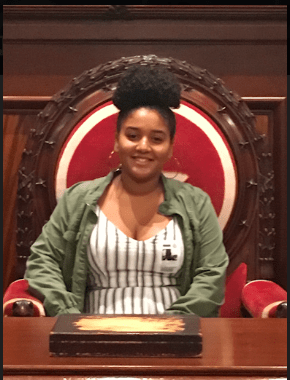 CSI Junior and Macaulay Honors College student Yeniliz Peguero had a unique opportunity, last December, to assist with the voting process for a referendum in Peru on combating government corruption. This opportunity resulted from a visit to CSI by Ambassador Maria Merino Villaran de Hart, Consul General of Peru during 2018 Phi Beta Delta induction ceremony. When all was said and done, Yeniliz reported that although the turnout was lower than it had been for other recent votes, most likely due to the fact that the referendum was announced late, three of the four proposals were approved. During her time in Macaulay, Yeniliz also interned for then-councilman Juumane Williams, who now serves the NYC Public Advocate. She noted that she attended meetings on behalf of Williams and that she was invited to join elected officials at the table as they discussed the topics at hand. She will also be studying abroad in Italy this summer, and will serve as a Macaulay Accepted Student Event panelist at CSI this month.